This is a small 10 cm tall handcrafted from clay (ceramic) figurine of Fulla. Order it alone or in combination with a Sun Post, a Stone Post or a Rune Post. In Germanic mythology, Fulla (Old Norse, possibly "bountiful") or Volla (Old High German) is a goddess. In Norse mythology, Fulla is described as wearing a golden band and as tending to the ashen box and the footwear owned by the goddess Frigg, and, in addition, Frigg confides in Fulla her secrets. Fulla is attested in the Poetic Edda, compiled in the 13th century from earlier traditional sources; the Prose Edda, written in the 13th century by Snorri Sturluson; and in skaldicpoetry. 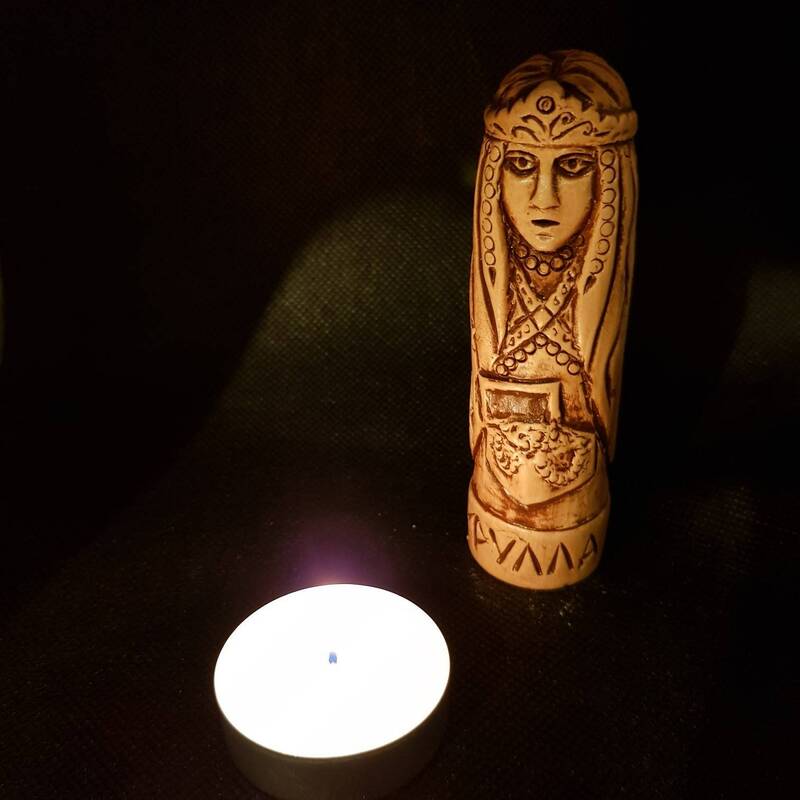 Volla is attested in the "Horse Cure" Merseburg Incantation, recorded anonymously in the 10th century in Old High German, in which she assists in healing the wounded foal of Phol and is referred to as Frigg's sister. Scholars have proposed theories about the implications of the goddess.